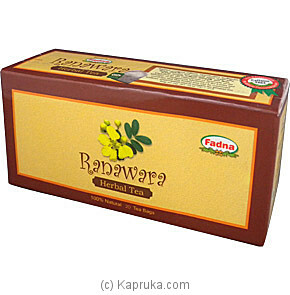 Totally natural Caffeine Free Ranawara Herbal Tea offers many medicinal benefits: According to the Ayurvedaya helps control sugar disorders. Also effective in relieving urinary problems and stomach cleaning. Promotes clear complexion and restoration of skin to its natural glow. Acts as an agent in restoring sexual vitality , increases sperm count, and counter acts ejaculatory disorders. Certified by the department of Ayurveda of the Ministry of Indigenous medicine of Sri Lanka and confirms that this herbal tea can be consumed without prescription and is suitable for general use.